Buxton Fire-Rescue » COME JOIN OUR TEAM! 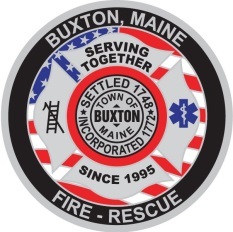 The Town of Buxton is accepting applications for the position of Firefighter/Paramedic (AEMT Accepted) for its Fire-Rescue Department, there is currently one open position. An active eligibility list will be kept for 6-months following this hiring process. Must hold and maintain a valid Maine EMS Advanced EMT license, Paramedic preferred. Must be able to work fixed and rotating shifts. Applications are available on the departments website or you may contact the Chief’s Office at (207) 929-3099 to have an application package mailed to you. Completed Application packages must be received at the Fire-Rescue Chief’s Office (185 Portland Road, Buxton Maine 04093) no later than April 26, 2019 at 1200 hours. EOE Statement: The Town of Buxton is an equal employment employer and reserves the right to leave positions open until a qualified candidate has been found. Posted in Uncategorized | Comments Off on COME JOIN OUR TEAM!